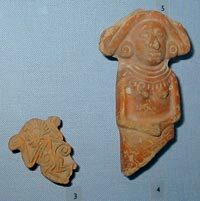 The two original Aztec pieces are both ceramic - a figurine of Xochiquetzal (goddess of love) and a terracotta printing stamp bearing a monkey design; both donated to the museum in 1925 by F W Lucas. 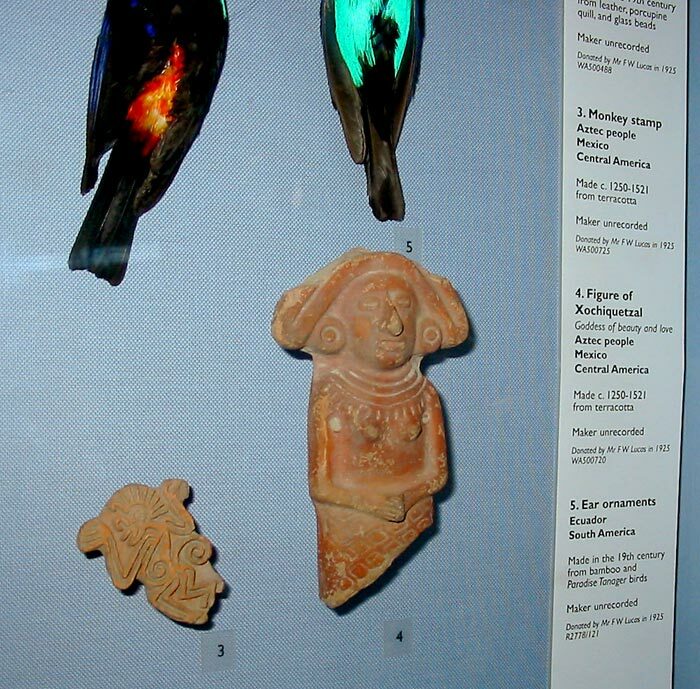 Some fine examples of Mexican folk masks, believed to have been acquired when Tony Shelton was Keeper of the collection in the early 1990s, can be viewed online (2011: link unavailable - we’re investigating!) as well as in our Masks photo gallery - we’re grateful to Sarah Posey, Brighton Museum’s Keeper of World Art, for allowing this. F. W. Lucas had a particular interest in objects made from natural or animal material - on display in Brighton’s Cabinet of Curiosities is this delightful basket made from the hard outer shell of an armadillo. 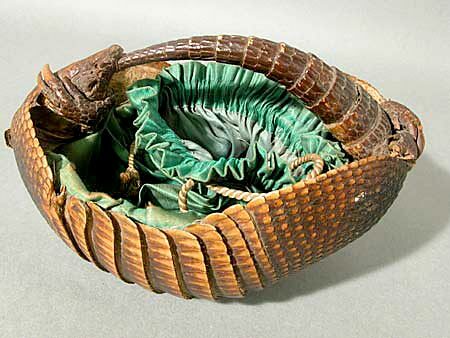 The handle is made of the tail of the armadillo which has been fastened into the animal’s mouth. The basket is lined with a green silk bag with an off-white drawstring cord. 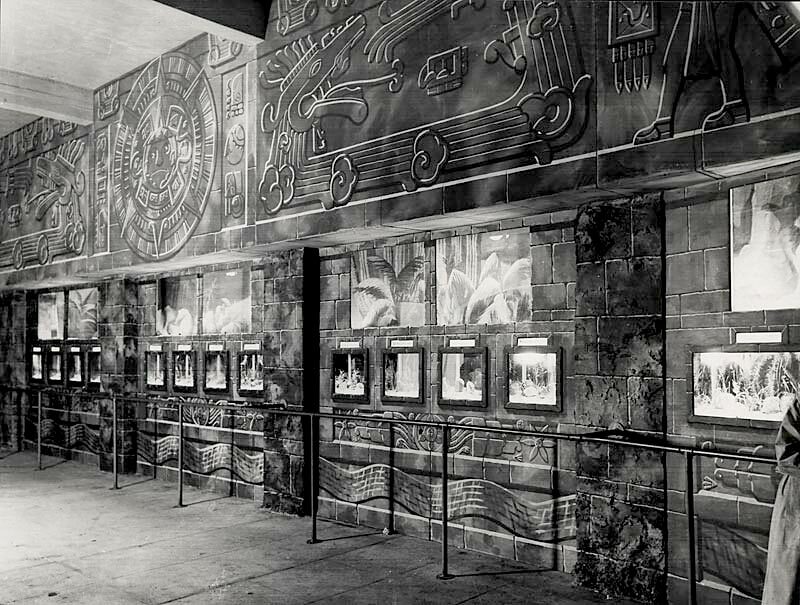 It was created by a Mexican Indian maker and donated to the museum in 1958 by a Mr. Hood. 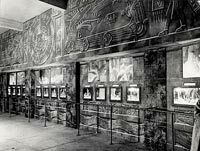 And buried in the museum’s photographic archives is this b/w image, taken around 1929, of Brighton Aquarium’s interior - given an ‘Aztec’ style re-vamp by Brighton Corporation in 1927. Can anyone throw any more light on this?! Also, the wallpaper in the banqueting room of the royal pavilion is supposed to be based on “Chinese” designs, but the serpents and birds depicted have an uncannily Mesoamerican look to them.